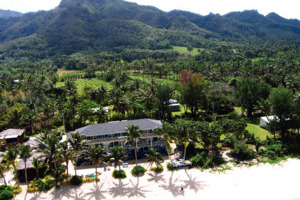 Located on a beautiful stretch of beach along the Rarotonga south coast overlooking the shimmering waters of a crystal-clear lagoon, the Moana Sands Beachfront Hotel offers elegant hospitality in an exotic setting. The perfect choice for those seeking spacious, comfortable and practical accommodation at an excellent price, the Moana Sands Beachfront Hotel offers Studios and Villas equipped with kitchenettes and positioned on the edge of the beach. The Moana Sands is located on Rarotonga's stunning southern coast and enjoys a prime location on the shores of a long stretch of idyllic white-sand beach. The resort overlooks the sparkling pristine waters of a crystal-clear lagoon; teeming with colourful fish, it's the perfect spot to swim, snorkel or kayak. 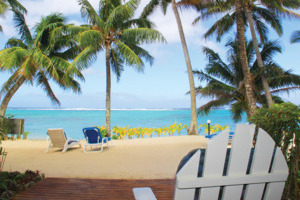 Moana Sands is an ideal base for anyone looking for an affordable, good value stay in the Cook Islands. The Beachfront Studio at Moana Sands Beachfront Hotel enjoys unforgettable views across the beach, lagoon and South Pacific Ocean from the patio/balcony. Features include a small kitchenette with light cooking amenities, while guests will also receive a daily tropical breakfast, a juice on arrival, housemaid service and complimentary use of a beach BBQ. The Deluxe Beachfront Studio at Moana Sands Beachfront Hotel are located on the top floor of the hotel and open out onto a private balcony for memorable vistas across the lagoon to the reef beyond. The Studio comes with a large kitchenette. The Two Bedroom Beachfront Villa at Moana Sands Beachfront Hotel is located a short distance from the hotel on the edge of a beach in Vaimaanga. Each luxurious Villa comes with two bedroom, two bathrooms and a stunning views of the beach, while features include modern kitchen facilities, a lounge, a dining area and a private balcony. The Taikura Apartment at Moana Sands Beachfront Hotel is a special holiday home separate from the Villas, making it ideal for those travelling a family or a larger group. 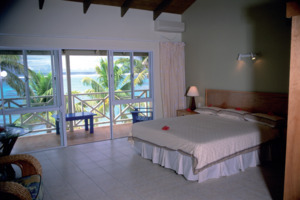 The Apartment offers two bedrooms, modern kitchen facilities, a dining area, a lounge area and easy access to the beach.